It's a bird! It's a plane! It's a brachiosaurus! Like any 2 year old, Bo loves playing dress up. She’s totally into necklaces and hats right now, especially pointy birthday-party hats. In fact, anything pointy is a “happy birthday to you” to her right now. She and I were making dinner recently and after I chopped an onion, she put the pointy, rooty end on her head and sang the birthday song. She’s also getting into wearing capes and crowns, but we’re doing our best to keep her away from the whole princess scene. What’s the deal with the princess craze? Do people really want to raise their kids thinking they’re royalty? Don’t kids have enough sense of entitlement these days? Isn’t the MTV show “My Super Sweet Sixteen” doing enough damage? And do people really want their little girls to grow up thinking Prince Charming is going to ride in and rescue them? Maybe we’re overreacting. I know there are plenty of people out there who disagree with our stance. But I suppose it’s our right to make certain rules in our house, and anyone who doesn’t like them can go kiss a frog. So I’m working on a costume project right now that hopefully will fulfill some of her dress-up fantasies without making her want a waistline like Aerial’s and shoes like Cinderella’s. I’m inventing her some super heroes and making capes and crowns appropriate to them. 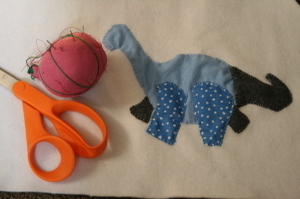 The first in the series is Dyno Mighty, a friendly pink and blue dinosaur. So far, I’ve appliquéd Dyno Mighty together, and now I need to sew together a cape and create some sort of corresponding crown. Maybe a wand, too? I don’t know. What sort of powers should a dinosaur have? They're pretty powerful on their own. Which is exactly the point, I suppose.